The first of the 68.75-metre-long blades at Bell Bay ready for transport. Bushfires in the State’s Central Highlands have halted construction of Goldwind Australia’s $300 million Cattle Hill Windfarm. Forty eight wind turbines will be built near the Waddamana power station as part of the wind farm project which will return to construction phase once the severe fire threat eases. With the project planned to be fully operational by late this year, 120 staff have been on site since last year to prepare for the arrival of key equipment. TasPorts has welcomed the first of the 68.75-metre-long blades to Bell Bay ready for transport to the site. TasPorts Acting CEO Anthony Donald said it was a major infrastructure initiative to coordinate. “This has been a complex project coordinating logistics between all involved parties,” he said. “We are expecting all turbine components to arrive across six shipments over the coming months. The Cattle Hill Wind Farm will have the capacity to power 63,500 Tasmanian homes. Goldwind Australia Managing Director John Titchen said the Cattle Hill Wind Farm project continued to have significant local benefits for the state during construction. 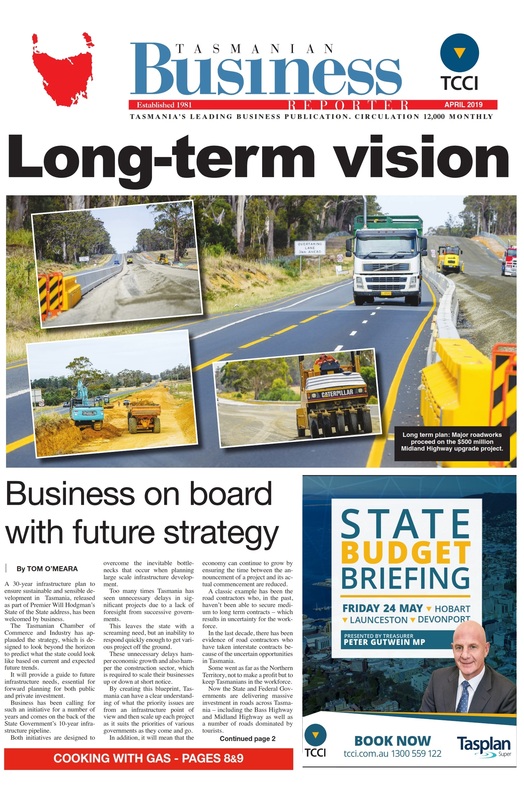 “Goldwind appointed Hobart-based Hazell Brothers to undertake the full civil and electrical works for the project and Launceston-based company Gradco to undertake road upgrades to allow for the delivery of wind turbine components and associated equipment,” he said. Up to 150 staff are expected on site during the peak of construction. Construction is also progressing on the $280 million Granville Harbour wind farm. Nearly 100 sections of wind turbine towers, each weighing almost 150 tonnes, have been transported from Burnie Port to a holding facility behind Bunnings Warehouse before they move on to their final destination. The 52 metre-long, 6.1 metre-high components were escorted by State Growth Transport Safety Officers in one of the largest road-based movements ever seen in Tasmania. “With Granville Harbour and Cattle Hill under construction, and Robbins Island and Jim’s Plain in the pipeline, more than 350 construction jobs have already been injected into regional communities with more than 400 construction jobs and 95 ongoing roles on the table,” Energy Minister Guy Barnett said. The government’s Tasmania First energy policy aims to make our state fully renewable-energy self-sufficient and to have the lowest regulated power prices by 2022.